LAge dairain (The Age of Bronze) by Rodin. Sold for £260,750. Photo: Bonhams. 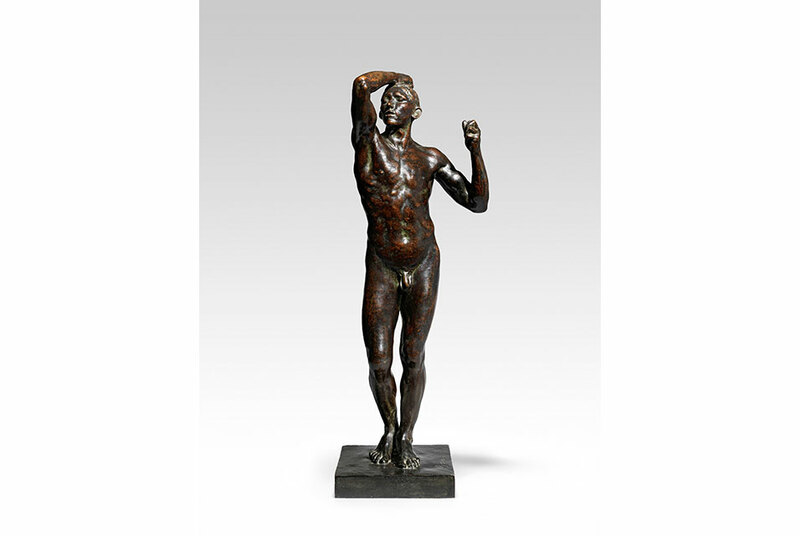 LONDON.- A bronze cast of one of Rodins most famous sculptures, LAge dairain (The Age of Bronze), sold for £260,750 at Bonhams Impressionist and Modern Art Sale in London today (28 February). It had an estimate of £100,000-150,000. Conceived between 1875-1877, L Age dairain caused great controversy when it was first shown. The figure was so intensely realistic that critics initially refused to believe Rodin had not simply made a cast of his model. The version of L Age dairain in the sale was cast between 1935-1945 by the Alexis Rudier Foundry in Paris and had resided in a private collection for generations.  Nature morte aux pêches by Pierre-Auguste Renoir. Sold for £200,000. Estimate: £100,000-150,000.  A cast of Rodins Faunesse à genoux (Kneeling Faun) that sold for £175,000. Estimate £100,000-150,000. It is one of the early studies for a similar figure that appears in Rodins masterpiece, La Porte de lEnfer.  Les mystérieuses by Paul Delvaux. Sold for £175,000. Estimate: £120,000-180,000.